Indonesia based custom builder, Radhit Modifikasi, have created a bolt-on kit that presents you the looks of the Yamaha YZF-R1 and the economy of the YZF-R15. The custom kit has been designed for the YZF-R15 V3.0, and it mimics the styling of the litre-class motorcycle. 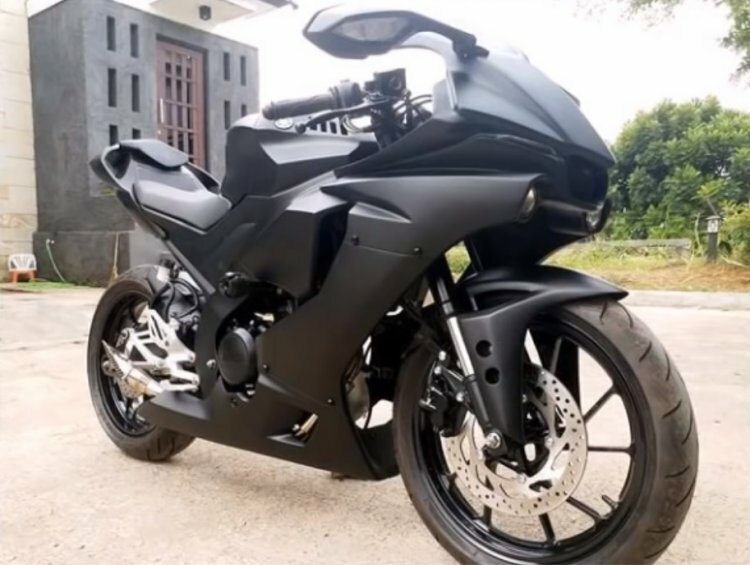 The fascia gets a pair of LED projector headlights with LED DRL on top, and the fairing design has been revised to the get the visuals closer to the YZF-R15. The fairing mounted front blinkers have been removed for a cleaner look while a pair of rearview mirrors with integrated turn indicators have been added to the package. The shape of the fuel tank has been tweaked to add a muscular look to the 155cc motorcycle. The revised tail section drops the rear fender and the number plate mount while the blinkers have been integrated into the panel, giving the bike a clean and compact look. Sides reveal a MotoGP style exhaust. A comprehensive visual upgrade gives the YZF-R15 a more appealing persona than the stock motorcycle. Rest of the specifications appear to be in stock condition. Thus, the braking department continues to use a single disc at the front and the rear. Being an Indonesian spec model, the motorcycle comes standard with upside-down telescopic forks that give the YZF-R15 V3.0 a big bike look. At the back is a monoshock suspension. There is no mention of mechanical upgrades either. For reference, the standard motorcycle uses a 55cc, single-cylinder, liquid-cooled engine delivers maximum power output of 19.3 PS power at 10,000 rpm. Peak torque of 14.7 Nm arrives at 8,500 rpm. The engine sends power to the rear wheel via a six-speed gearbox. The engine comes packed with features like Variable Valve Actuation (VVA) technology and assist and slipper clutch. The litre-class Yamaha YZF-R1 inspired bolt-on kit gives the 155cc YZF-R15 V3.0 gives the motorcycle all-new body panels and integrated blinkers for a neat and clean look. Back home, the YZF-R15 V3.0 has received the safety net of dual-channel ABS along with a price increase of INR 12,000. The Yamaha YZF-R15 V3.0 ABS is available at an ex-showroom (Delhi) price tag of INR 1.39 lakh. The new Darknight colour option carries a premium of INR 2,000 over the existing colour options and retails for INR 1.41 lakh (ex-showroom Delhi).